Teenage Mutant Ninja Turtles (2003) Season 2, Part 2 Review – AiPT! Are you exhausted? Because I know I sure am. With this review, we come to the conclusion of the 4Kids Teenage Mutant Ninja Turtles cartoon’s most ambitious storyline from its early days. “Secret Origins is the last act of a nonstop 10-part saga, and boy has it been taxing. While the second act, “Turtles in Space,”Â wasn’t exactly my cup of tea, the three-episode “Secret Origins” is a bit more my style, featuring less sci-fi shenanigans and more Foot Clan ninja stuff. Oh, and there’s also, like, three other episodes. But they aren’t as important. The Turtles return to the TCRI Building with the Fugitoid and a few Triceratons in tow. They’re reunited with Splinter, who reveals that Mortu and the Utroms aren’t the monsters they thought they were. While the Turtles get a crash course on Utrom history via a VR simulation, the National Guard begin an assault on the TCRI Building while Baxter Stockman works to secretly infiltrate it. âSecret Originsâ mishmashes a few Mirage story elements along the way, but the bookending sequences of the three-parter derive most of their inspiration from TMNT (Vol. 1) #7. What they choose to decompress in order to make one issue of the comic cover three episodes of the cartoon is actually rather clever. In the comic, the history of the Utroms on Earth and their relationship with the Turtles was somewhat rushed through in order to make room for the action (a battle with the Triceraton tagalongs and then the National Guard). Instead, “Secret Origins” gives the history segment time to breathe via a VR simulation (which operates under “Matrix” rules, meaning if you get hurt in the simulation, you get hurt in reality). The fight with the Triceratons is skipped almost entirely; as soon as they arrive in the TCRI Building by accident and open fire, Mortu has them teleported back. All except for one, Zog, who escapes into the sewers. 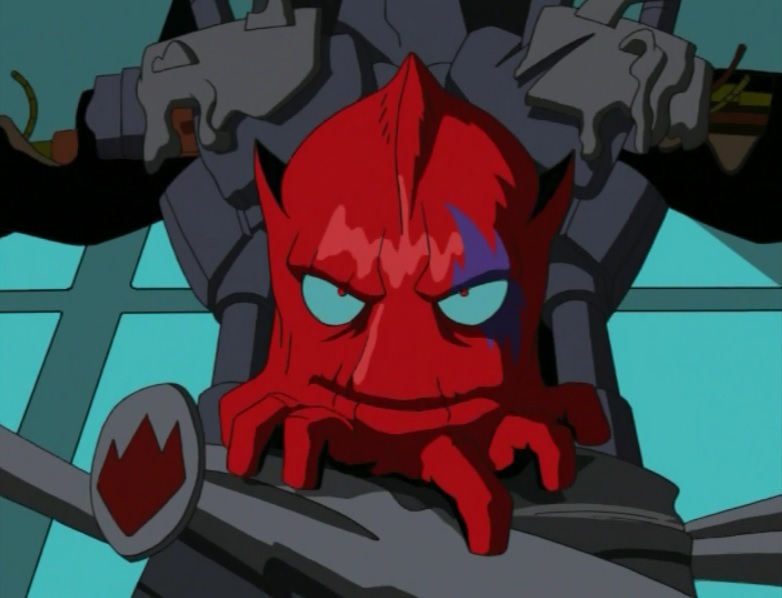 The 4Kids TMNT cartoon adapted the Mirage arcs out of order; originally, Zog’s escape was a prelude to the “Return to New York” saga. But that got covered in season 1. Instead, Zog is going to simmer on the back burner for a while and he’ll play a central role in an original storyline. Getting back to the VR simulation of how the Utrom’s got to Earth, the writers use it as an opportunity to tie together a lot of the mythology elements they’d been establishing since season 1, providing many much-needed answers. By this point, the 4Kids series had developed a much richer and more complicated back story for their versions of the TMNT than what Mirage had accomplished in seven issues, so stretching the history lesson out feels less like padding and more like an opportunity for legitimate exploration. Additionally, the “VR simulation” thing avoids the issue of exposition entirely, gets the Turtles involved in the narrative (even if it’s a history lesson), and the whole “Matrix rules” thing provides some suspense as the Turtles aren’t safe, even if it’s all just an illusion. This s--t is so much better than “Turtles in Space,” I’m just sayin’. A lot of other stuff happens in this episode, too. It’s like the antithesis of the decompressed “Turtles in Space.” Baxter Stockman makes his return, now reduced to nothing more than a decapitated head attached to robotic spider legs. And can you believe he’s not done losing body parts, yet? He’s the one who rewires the VR machine, trapping the Turtles in the simulation and making it deadly. The biggest introduction in this episode is the renegade Utrom responsible for sabotaging their space ship 700 years ago and marooning them in Feudal Japan. He’s unnamed in this episode, but his identity will eventually be revealed as Ch’rell. There’ll be another reveal, but we’re not there yet. I do want to say, that considering how this episode is paced, the “reveal” seems obviously telegraphed. Yet it still caught a lot of viewers by surprise. But I won’t get ahead of myself. And then there’s the Feudal Shredder (postulated by Donatello to be an ancestor of the present day Shredder) and the 11th century Foot Clan. They wind up warring with the Utroms and we get some context to the Shredder’s season 1 grumblings about his “ancient foes.” It’s all coming together, now. Then there’s April and Casey, whom you may have forgotten even existed considering their absence throughout the first five episodes of this season. They don’t do much, except gawk at the National Guard surrounding the TCRI Building. They’ll spend this arc coming up with schemes to try and get past the blockade, which doesn’t amount to much, but it’s a hell of a lot more than what April did during the Mirage comic’s go at this storyline (she spent it in a fetal position, crying). Trapped inside the VR history simulation, the Turtles become the prey of the Shredder. Meanwhile, with the TCRI Building under threat from the National Guard, the Utrom Navigator Council order Mortu to pack everything up and teleport them back to their homeworld. But if he leaves now, the Turtles will be doomed. The history lesson continues, as we witness the creation of the Sword of Tengu (very cool scene) and the birth of the Guardians. There’s a kickass sequence where the Feudal Shredder wields the Sword of Tengu against the Turtles and the Guardians and we get to see what he was capable of with the weapon. Sadly, it’s a short sequence, and one that doesn’t “count” since it’s all a simulation, but it makes you wish the Shredder could have kept the sword beyond the first season (during which it was mostly out of his grasp, anyway). Speaking of the Shredder, the REAL Shredder makes his triumphant return in this episode, infiltrating the TCRI Building thanks to the machinations of Baxter Stockman (once again forced to work for him). When the Turtles escape the Oracle Pods and are confronted by the Shredder, he gets to growl out one of his best lines in the series to a horrified Leonardo: “You merely separated my head from my body, a courtesy I will gladly extend to all of you.” Man, Scottie Ray’s Shredder was just the freakin’ best. They do a thing in this episode, twice in a ROW, that I thought was a little annoying. So Splinter figures out how the Turtles can get themselves out of the simulation, but just as he’s explaining it to the Leonardo, the Guardians and Mortu interrupt. Seconds later, Mortu is about to tell the Turtles something very important about the Shredder, but is interrupted mid-sentence when the Foot Clan attacks. He tries to tell them the secret about the Shredder again, but is cut off when the Turtles awaken from the Oracle Pods. It’s an irritating exercise, especially when it happens in rapid succession. There’s some interesting censorship in this episode, where violent or otherwise “naughty” material that BS&P would normally never permit to appear in a kids cartoon is creatively included. For instance, when the National Guard opens fire on the outside of the TCRI Building, their guns are drawn to look like sci-fi laser pistols, but they make automatic weapons-fire sound effects. And the “lasers” that come out of them are animated to look more like tracer ammo. You can tell that it was done strategically, to get bullet-firing guns into the show in a way that would trick the censors into thinking they were lasers. Less creative is Michelangelo’s grievous injury at the hands of the Feudal Shredder, which forms much of the episode’s suspense. When the Shredder hit him at the end of last episode, it was with his gauntlet blade and even made a “hacking” sound effect. The characters all react like Mikey has a deep wound, and the seriousness of his injury points to that, as well. Of course, he isn’t drawn with a wound of any kind. I guess we were just supposed to use our imaginations. This episode is essentially one big fight to keep the Shredder and the Foot Clan occupied while the Utroms and the Fugitoid escape on the transmat back to the Utrom Homeworld. It’s more engaging than you’d think, as the National Guard are descending from above and lots of stuff is happening in the chaos (including a really ominous moment where a Guard thinks he sees the silhouette of an alligator-man escaping in the smoke). In the end, the Shredder sets a bomb that will blow up the TCRI Building and the suspense REALLY ramps up. But let’s talk about that Shredder fight. Once the Utroms and the Fugitoid escape safely and April and Casey (disguised as reporters) use a fake terrorist threat to get the National Guard to withdraw from the building, the Turtles focus all their energy on KILLING the Shredder. They take their weapons and stab him. Just as with the ending of “Return to New York,” the 4Kids Turtles display a killer instinct and they’re all about murdering their enemy. â¦And then the Shredder’s torso opens up and he’s revealed to have been Ch’rell the renegade Utrom all along! Oh man, fans were PISSED. The reveal was telegraphed pretty hard throughout âSecret Originsâ, but I think a lot of viewers just pushed all the hints to the back of their heads because, “Nah. No way they’ll make the Shredder an Utrom.” But they did. And you know what? They really made it work. The 4Kids TMNT cartoon was big on adapting the Mirage comics, but if they rigidly stuck to that canon then they were never going to be anything more than “Mirage Lite.” The show had developed its own unique mythology and back story wholly individualized from the Mirage comic and the Utrom Shredder had a vital place in that tapestry. His threat isn’t diminished by being an Utrom and he isn’t any LESS the Shredder because of it, either. Hell, the stuff this Shredder does throughout the course of the series arguably makes him the deadliest and most dangerous incarnation of the character, bar none. But he’s still a squishy little alien brain in a robot body, and some folks still haven’t come to terms with that over 10Â years later. This episode is stuffed with other things worth mentioning, too. Baxter frees himself from the Shredder’s control and escapes, and there’s the aforementioned setup for Leatherhead (a very brief and eerie moment, done very well). Those two elements will coincide in a later episode this season. Also, Mortu gives Splinter an orb that allows him to commune with the memory of Hamato Yoshi, revealing him to have been a Guardian. Along with the setup for Zog, “Secret Origins” is as much a finale that delivers on answers as it is the prologue for several new storylines. And there’s an odd amount of callbacks to the 1987 Fred Wolf TMNT cartoon clustered in this episode. When April disguises herself as a news reporter, she wears a yellow jumpsuit with a “Channel 6” ID badge (actually an upside-down 9). When they make the fake call about the terrorist organization threatening to blow up the TCRI Building, Casey says their name is “Goongala Cowabunga.” And lastly, when the Utroms are boarding the transmat, one of them speaks in a squeaky, whiny voice and is identified as Krang. The 4Kids show was generally very coy about making callbacks to the Fred Wolf cartoon, with references to it being few and far between. If anything, this episode feels like the writers were trying to get it all out of their system now so they won’t be tempted to do it again later. The episode ends with the Turtles escaping the TCRI Building before it explodes, leaving the Shredder behind to get blown to kingdom come. I don’t think this will count as a spoiler to any of you, but he’ll be shown later this season having survived. The manner in which he’s “killed” in this episode, blown to pieces in an explosion, would seem to be a callback to his first Mirage comics death in TMNT (Vol. 1) #1.Â When he returns later this season, he’ll be shown having been stitched back together by worms, a callback to how he returned in the Mirage comics as seen in TMNT (Vol. 1) #21. And speaking of the Shredder surviving the explosion â¦ HOW? The TCRI Building isn’t blown to rubble, it is literally vaporized! Disintegrated! There isn’t anything LEFT of the Shredder to be stitched back together by the worms. But whatever, it’s a cartoon. Anyhow, we’re finally done with this massive 10-part saga. âThe Search for Splinter,” âTurtles in Space,” and “Secret Origin” trilogy form the show’s most ambitious saga, at least in its early years. While it definitely feels bloated in the middle, it certainly does have an epic quality to it. We get answers to lingering season 1 questions, action in both the sci-fi and Foot ninja vein, and a massive expansion of the show’s mythology. It was tiresome but fun, though I’m glad the series will be getting back to episodic adventures for a while. To recuperate from their latest ordeal, the Turtles and Splinter return to Northampton to decompress, meditate, reflect and watch clips from previous episodes. What? A clip show? Well, this review won’t take long. I’m actually a little surprised that at 156 episodes, the 4Kids TMNT cartoon only resorted to a single clip show. That’s not a bad deal. Then again, the Fred Wolf TMNT cartoon ran for 193 episodes and only resorted to one clip show, so there’s really no excuse. So far as clip shows are concerned, “Reflections” is graceless in how it tees up the clips (“Hey, remember that thing that happened yesterday?”), but the narrative theme maintains a focus all the way through. All the clips are centered around their encounters with the Shredder, effectively summarizing the entire Foot Clan arc from the first 35 episodes. It all leads up to the revelation that had that Shredder not crashed the Utrom ship on Earth, the ooze would never have been created and the Turtles would never have been mutated. A rather obvious revelation, but at least it tries to give a clip some sort of narrative impact. With fewer minutes of new footage to animate for this episodes, the budget doesn’t get spread out so much, so the original footage all looks really good. The cold open, in particular, offers a sort of ominously interpretative recap of the TMNT’s origin and it looks pretty cool. Other scenes of the Turtles training in Northampton and Casey, uh, trashing a lawn chair, also have a lot of frames to them with plenty of fluid movements. So it’s a clip show, but pretty watchable so far as clip shows go. A mysterious warrior from another dimension called the Ultimate Ninja has traveled to New York for one reason only: To challenge Leonardo and slay him in battle. What the hell’s his problem? No sooner is one long-simmering storyline wrapped up, several more are thrown at us in rapid succession! Well, that’s not 100 percent true. There’s a small moment at the beginning of this episode where Raphael watches a TV newscast about the rise in gang violence, which will come to a head later this season during the “City at War” storyline. But that arc was actually teased near the end of season 1 in “Lone Raph and Cub.” So if anything, the episode is reminding us about a story arc you may have forgotten was being built up to before all that Utrom and Triceraton s--t threw everybody off track. Likewise, April’s living with the Turtles in the sewer lair. Huh? Why? Because the Second Time Around shop burned down midway through the previous season. The narrative has just been so jam-packed and hectic since “The Shredder Strikes Back”Â that it’s easy to forget April’s spent nearly 20 episodes as a transient. The bigger arc set in motion with this episode is the buildup to “The Big Brawl” multi-parter (more commonly called “The Battle Nexus Tournament” arc). There’s all this stuff about Splinter knowing this and that about the weird interdimensional warriors coming to challenge Leonardo and the rules and regulations that preside over the battle, but he’s playing coy about it. Because we’ve still got half a season left. Goofy merchandise-centric name aside, this guy’s got a cool (if busy) design and pretty intimidating presence at first. The way he teleports by swirling his cape is a snazzy effect, and his cape in general takes on a life of its own at times, billowing around him and reaching out like it’s alive. I can’t help but feel this was intentional on Director Chuck Patton’s part as a callback to his work on HBO’s Spawn. His voice (provided by Ted Lewis) is an interesting counter to his appearance. He looks all fearsome and spooky, but when he finally starts talking, he sounds like a petulant youth. Appropriate, as you find out in the final minutes that the Ultimate Ninja is exactly that. The Ultimate Daimyo (his action figure name) shows up to collect his son and apologize to Splinter for all the trouble, and you know what I just realized? The naming convention for this family is consistent: âUltimate Daimyo,” âUltimate Ninja.” Following Japanese naming conventions of familial name first, given name last, does that mean that their surname is “Ultimate”? Like, as a Westerner, would I address either of them as “Mr. Ultimate”? I assume at some point there was a Mrs. Ultimate? The mind boggles. Lastly, the Daimyo mentions offhandedly that when he and his kind visited the Earth centuries ago, the native Japanese population thought they were demons and thus began the legend of the tengu. All that s--t about the tengu and ancient Japanese demons will ultimately wind up being important when we get to season 5. IF we get to season 5. I dunno if I’m gonna live that long. Having survived incineration, Nano kidnaps the scientist who created him and the con artist who raised him, thinking they’re his mother and father. When things don’t work out, Nano attacks Coney Island where Casey and April are on a date, leaving the Turtles to come to the rescue. So remember last season when the Turtles nabbed an Utrom hover skiff from the TCRI Building. How could you forget? Well, last episode Donnie was reverse-engineering it for new toy potential, and it comes to fruition in this episode in the form of a flying skateboard. Weirdest thing, though? Playmates never made a toy out of the flying skateboard. Guess it was a dropped concept (and that’d explain why it won’t get used very much). Anyway, that takes up a chunk of the first act: Product placement without a product. There’s also copious amounts of foreshadowing for the “City at War” arc, but dammit, we aren’t there yet! More interesting than that is the development of Casey and April’s romance, which finally evolves beyond awkward flirting and into an actual date. While their will-they-won’t-they thing will stagnate for a while, there WILL be actual payoff in the final season of the series. So many shows never follow through on their romantic arcs, like the characters will wither and die if they eliminate the sexual tension, that we often end up with cocktease romantic arcs too scared to bear fruit even in the final season. Not so with the 4Kids Casey and April, thank god. Oh yeah, and Nano’s back. They don’t spend a lot of time explaining how he survived his death from last season,Â Donnie just theorizes that a nanobot escaped incineration and has spent these past months replicating itself, and that’s okay. We don’t need much more than that. The bigger issue with “Modern Love â The Return of Nano,” aside from the preposterously overblown title, is that it’s just more of the same from last time. So Nano kidnaps some people because he has the mind of a toddler, tries to make them act like his parents, he scares them away, goes crazy, and then he’s left to die at the end. The first Nano episode had some emotional value to it, seeing what’s essentially a lonely child suffer and die, but the sympathetic investment only really works once. Try to repeat it and you’re gonna get diminishing returns. While all these other arcs are developing off to the side to lead us into more interesting stories this season, the central plot involving Nano is basically a rerun of what we saw last time. It might explain why after this episode, Nano is going to take a break for a long stretch of episodes. I guess if this episode tries anything new with Nano, it’s that it portrays his affections for his âparentsâ in a creepier manner. When he kidnaps Harry and Dr. Richards, he creates a “Leave it to Beaver” house and scenario and tries to reenact a saccharine piece of Americana as a means to feel like a normal child. When the two humans start arguing over whose fault it is that their “son” is a lunatic, the dream house begins to transform with Nano’s raging emotions into something spikey and dangerous. It’s actually a really memorable scene; before I sat down to rewatch this episode, it was the ONLY thing about it I remembered (I’d forgotten about the finale in Coney Island and everything). Speaking of Coney Island, it provides a cool setting for the climax, giving Nano ample resources to create a bizarre new body for himself. Absorbing rollercoasters and funhouses, he winds up with an appropriately bizarre carnival sideshow look, complete with a dragon for an arm. So even if the episode doesn’t break new ground with the character and repeats itself, there are some genuinely good moments in it that might stick with you. Well, that’s it for this batch. “Secret Origins” was fantastic and “The Ultimate Ninja” wasn’t half bad, either. The rest was a clip show and a meh retread of a season 1 episode that spent more time teasing other arcs (I didn’t even mention that April gets a reward for returning the jewels Harry stole, which will allow her to rebuild the Second Time Around Shop and move out of the lair later on). Next time, we’ve got the return of the subterranean mutants nobody liked, a badly watered down adaptation of the Mirage comics “City at War” storyline, and Leatherhead. Aw yeah. LEATHERHEAD!